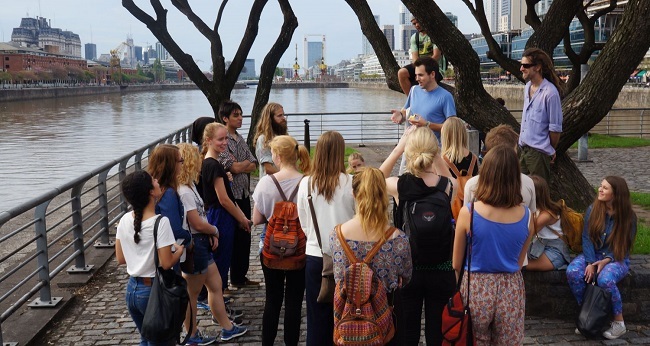 In Buenos Aires we offer the History of philosophy with environmental philosophy. In addition, you select one of the following topics; Spanish; Corporate Social Responsibility - CSR. The studies are offered in collaboration with Universidad Nacional de San Martin. 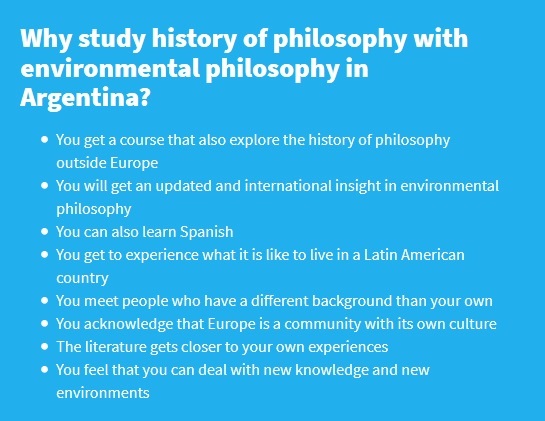 The History of Philosophy with environmental philosophy in Argentina gives 15 credits. The subject provides students with an introduction to the history of philosophy. During this introduction, it is a pervasive focus on how the philosophy has shaped the perception of the human relationship to nature. Students will get an introduction to selected basic problems in philosophy and research. Central and influential contribution in the history of philosophy are analyzed and discussed. The topic focuses on the precursors to modern society, such as the development of science, scientific recognition and understanding. The overall realization students get, is used to explore how philosophy can work as an actor for change in a time of great challenges related to environmental issues. have knowledge of key questions related to knowledge and moral practices, as they are answered throughout the history of ideas, and be able to relate these to the current ecological debate. have knowledge of basic philosophical concepts, central thinkers in the history of philosophy, knowledge of the main arguments for and against a number of influential philosophers. have a basic understanding of scientific though and the influence of science on social development. be able to analyze different types of texts in relation to their arguments and viewpoints. engage in basic discussions in a number of key issues within the history of philosophy. identify and reflect independently around a number of fundamental ethical issues and questions, again in special relation to ecological issues. discuss claims and arguments independent of their own conclusions. treat knowledge as provisional: theories, positions, and perspectives rest on assumptions that may be subject to revision. analyze and assess ethical dilemmas. work both independently and in groups. apply relevant academic tools and techniques. compose academic texts as well as present academic work orally. be able to think critically. have a critical and reflective understanding of education. have the ability to see connections between worldviews (ontology), the ways in which knowledge is formed (epistemology), as well as ethics. be able to think critically about scientific knowledge production. be generally oriented in philosophy, text, and science. be able to think critically about different forms of knowledge production. have insight into the requirements for academic texts, and how such texts can affect society. Self-study period: before you travel to Argentina, you are expected to get acquainted with the subject and to write a short assignment. The main period: consists of four months of lectures, seminars, field trips, group assignment and written individual assignment/exam in Buenos Aires. This course can be included in a university or university college bachelor or as part of an Argentinian bachelors degree at Universidad de San Martin.